Coriander is an important component of Indian cuisine. Both fresh coriander leaves and coriander seeds are rich in vitamins, minerals and dietary fiber. Coriander seeds are used in native medicine preparations. Method: Heat 1 teaspoon oil in a kadai, add red chillies and fry till they turn dark in color. Then add urad dhal and Bengal gram dhal and fry till the dhals turn reddish brown in color. Wash the coriander leaves well, and chop into small pieces. 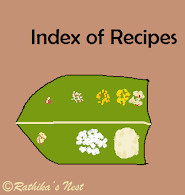 Grind coconut, fried ingredients, tamarind, chopped coriander leaves and salt with required water into a fine paste. Heat oil in a tadka pan, add mustard seeds and once they start to sputter, switch off the fire. Add the seasoning to the ground chutney. Serve with idly, dosa, adai, appam, kuzhi paniyaram or uppuma.